This entry was tagged Andes Mountains, art and social life, Inca civilisation, Machu Picchu, music, my music, Peru, philosophy, photography, Sunset in Peru. Bookmark the permalink. Phil. is this you ? you are full of surprises. 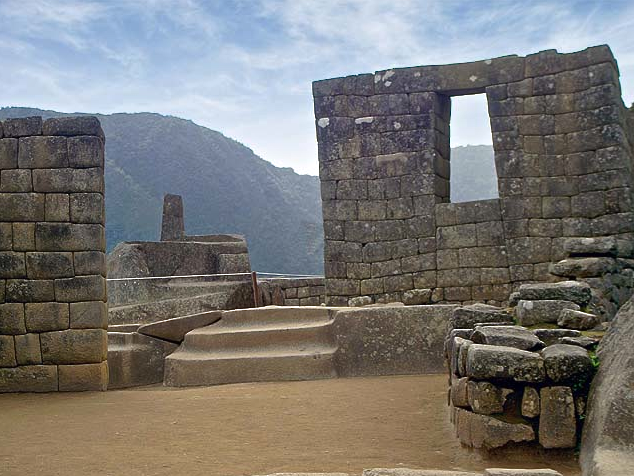 Hi Tach, the photo isn’t mine – I wanted to find a different view of Machu Picchu than the usual ones – spectacular as they are (have you been there? I haven’t. It would be an amazing place to visit.). But the music is mine. Beautifully put together. Are they computer generated instruments played on keyboard? And the percussion, how are you generating or playing them? if you can indicate. I’m impressed. Thank you for your generous words, Tach. I recorded my compositions for all my posts on a keyboard I bought quite a few years ago. When I bought it, it was a ‘toss up’ between buying that or another piano (it would have been a Kawai upright like the one I owned previously – also amazingly small). I opted for the keyboard because of its portability (I made tentative approaches to finding work as the ‘piano player’ in bars and restaurants but took it no further – I remember playing my recording of Sunset in Peru for the owner of a Peruvian restaurant who didn’t realise that all the sounds came from a keyboard – I felt, as they say, ‘chuffed’) and because of the keyboard’s instrumental potential. I play some flute, guitar and piano, and like to voice myself sometimes with words. Lots of improvising but have some formal background. Great to share this common ground after the ground covered so far already with you. I’m the background music to video in the “Artist of the month” article. Am also curious about your Syd Uni association – you checked on how your music posts played on a different computer there. Your music went very well with your video for ‘Artist of the Month’. I particularly remember how you closed your fingers and bent your wrist to convey your meaning in your video on your blog when you discussed your work. It was very expressive and effective. My Sydney uni association is that I am completing a thesis there which will be due next week. I will not have it done on time and have opted to be failed (rather than withdraw). It concerns a matter for which I have lived the last 32 years of my life – to understand and have recognised the impact of mysticism on Western culture and its relation to a materialist perspective (my blog is an offshoot of this) and I will consider being failed as solely reflecting on a deeply sick, anti-intellectual and servile culture. I will be taking this matter up with the university after I complete my thesis and publish it on my blog. The influence of convict culture (with its shame, cynicism, inferiority, guilt and religion of the ordinary) is as much present in Australian culture (in which the events at Gallipoli in the first capitalist world war – a military disaster following an attack on a foreign country on behalf of a dominant power – are held to embody what it is to be ‘Australian’) as that of the words of the Puritan John Winthrop – that their community would be ‘as a city upon a hill’ (words virtually copied by Chifley and recently aped by Abbott), watched by the world – is on American culture. Despite all the criticisms that can and should be made of the United States and what has been and is being done on behalf of US capitalism, the recognition of the importance of vision has always been at the heart of that culture. It is on the basis of this that they constantly search the world to take to them ‘the best and brightest’ and they recognise the centrality of education to this. When the GFC hit the US, one of the first things Obama did was to give a massive injection of funding to the US education system. What has happened in this regard in Australia, which, with its coal and minerals to dig up and flog to China, virtually escaped the GFC? It is an emblematic disgrace. Till the day I die, I will salute Utzon for leaving this country and refusing to ever be drawn back by the incessant attempts of Australians embarrassed and exposed not by his sudden departure (that could be excused by and contained to his differences with the Minister for Public Works) but by the international reputation his design for the Opera House won and desperate to cover over (not learn and progress from, despite all their subsequent hype and blather to the opposite – which can be seen every semester, as an example, when Australian universities compete to attract enrolments) their anti-intellectual littleness of spirit. ‘Intellect’ and ‘culture’ at heart do not refer to an accumulation of past achievements and their reinforcement, they are living concepts which embody an eager view to the future, towards what has yet to be discovered and achieved. To embrace them is to embrace difference, change and uncertainty – all of which are deeply threatening to dozy Australian conformism – as Keating said, at the arse end of the world. My regret with regard to Utzon is that he was too much the Nordic gentleman to ‘break his silence’ on this most important matter.